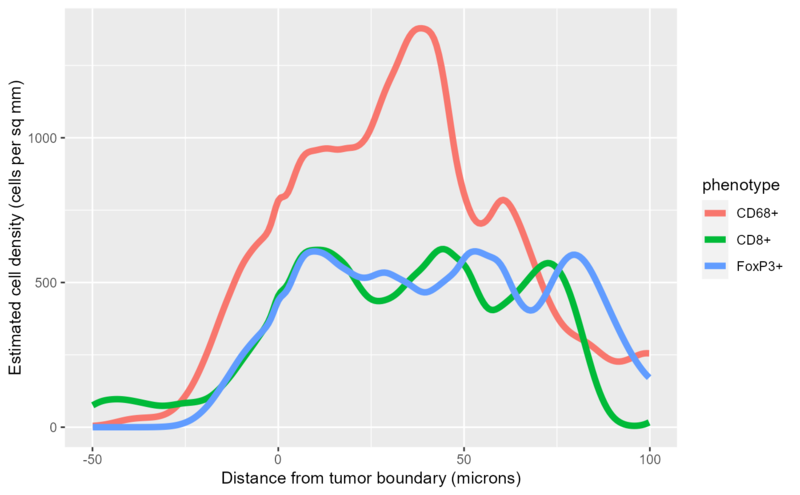 Estimate cell density at distance from a tissue boundary. Given a cell seg table and an image containing masks for two tissue classes, estimate the dependence of the density of cells of each phenotype on the distance from the boundary between the two tissue classes. If true, compensate for edge effects by masking the image to exclude cells which are closer to the edge of the image than to the tissue boundary. Additional arguments passed to rhohat. Default parameters are method="ratio", smoother="kernel", bw="nrd". The density estimates (see Details). the tissue boundary than to the border or other regions. The cell density estimate is computed by rhohat. The signed distance from the boundary between the two tissue classes is used as the covariate and density is estimated separately for each phenotype. 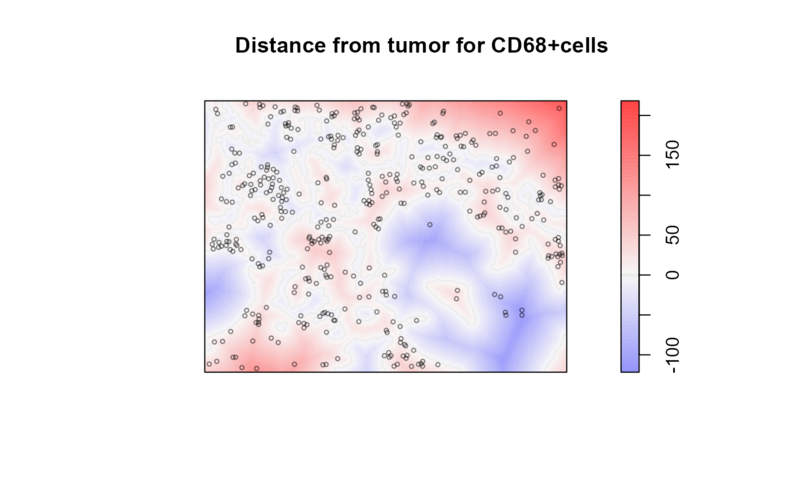 rhohat uses kernel density estimation to estimate the dependence of cell count on distance and the dependence of area on distance. The ratio of these two estimates is the estimate of density vs distance. The rhohat element of the returned list is a list containing the results of the cell density estimation for each phenotype. Each list value is a rhohat object, see methods.rhohat. The rhohat function does not have any built-in edge correction. This may lead to incorrect density estimates because it does not account for cells at the edge of the image which may be near a tissue boundary which is not part of the image. The mask parameter, if set to TRUE, restricts the density estimation to cells which are closer to the tissue boundary in the image than they are to the edge of the image or any other tissue class. For both mask==TRUE and mask==FALSE, the results tend to be unreliable near the distance extremes because the tissue area at that distance will be relatively small so random variation in cell counts is magnified. density_at_distance supports parallel computation using the foreach-package. When this is enabled, the densities for each phenotype will be computed in parallel. To use this feature, you must enable a parallel backend, for example using registerDoParallel. A. Baddeley, E. Rubak and R.Turner. Spatial Point Patterns: Methodology and Applications with R. Chapman and Hall/CRC Press, 2015. Sections 6.6.3-6.6.4. #> Warning: `as_data_frame()` is deprecated, use `as_tibble()` (but mind the new semantics).